Unfortunately, AFFIL will be winding down its operations as of September 30, 2010. Given the new Dodd-Frank bill and the creation of the Consumer Financial Protection Bureau, we’re declaring victory and calling it quits! You can read our final press release in the previous blog post. If you’re a member of the AFFIL mailing list, your membership will continue with Americans for Financial Reform. Stay tuned for important news and updates from AFR! Thanks so much to everyone who participated in AFFIL over our three and a half years! Thanks especially to our members, blog readers, and website visitors. Read on for a list of what AFFIL has accomplished. AFFIL’s initial public awareness campaign in 2007 included market-tested full-color print ads which appeared in Sports Illustrated Latino, The New Republic, and AWARE magazines. The artwork, created by ad firm Benenson Janson, was also used on AFFIL’s website and in online advertising, and appeared in a New York Times column about the campaign. Working with media firm Geoffrey Knox and Associates, AFFIL regularly appeared in the press. The organization published several Letters to the Editor in the New York Times and Boston Globe, and a prescient “Reporters’ Guide” to the mortgage meltdown in 2007. Predatory Lenders. Maxed Out is both entertaining and informative, educating viewers about debt, predatory lending, and deregulation. AFFIL co-hosted around 30 public screenings of the movie, reaching thousands of people. In collaboration with Public Citizen and Consumers Union, AFFIL sponsored 600 “House Parties” where small groups watched the DVD and discussed the film in their homes. Through AFFIL’s “lending library,” 150 additional consumers were able to view the movie. AFFIL was listed as the go-to resource at the end of the theatrical cut of the film, the DVD included a special feature about the organization, and the book features AFFIL in the discussion questions. AFFIL brought together twenty national “Partner” organizations, many of whom first met under the AFFIL umbrella and now regularly collaborate. AFFIL also worked with dozens of locally focused groups around the nation, and supported successful state-based campaigns to end payday lending. AFFIL also reached and engaged individual consumers, especially online. Over half a million consumers visited the website to learn, comment, file complaints, and take action. Individuals used the site to send over 50,000 messages to decision-makers about the need to reform the lending industry, and posted hundreds of their own stories to the site. AFFIL is bequeathing over 500 consumer stories to Consumer Action for its public education and advocacy efforts. Its mailing list and social networks – reaching about 40,000 people – will stay active through Americans for Financial Reform. AFFIL also responded to requests for help from hundreds of consumers, referring them to agencies such as the National Association of Consumer Advocates and Consumer Action. Approximately 75,000 people visited the “File a Complaint” section of the website to complain to bank regulators. Online Video – In partnership with communications firm By George and Company, AFFIL produced an online video for the college audience, warning about on-campus credit card solicitations. District Outreach – AFFIL placed radio ads about predatory lending in Kansas City, KS, an area represented by Rep. Dennis Moore, a key member of the House Financial Services Committee. AFFIL also provided expertise to its Kansas-based ally, Sunflower Community Action, in their communications with him. Rep. Moore ultimately voted in favor of the reforms. Member Comments – AFFIL members submitted over 10,000 comments to the Federal Reserve Board urging reform of credit cards. Hundreds of these included personal stories of abuse. Credit Card Debt by State and Common Tricks and Traps – To increase media coverage of credit card abuse, AFFIL published a list of which states had the highest levels of debt and a list of common tricks and traps. Both were mentioned in dozens of news outlets. Credit Card “Insiders” Speak Out – AFFIL assisted three former MBNA employees in publicizing their stories about MBNA’s abusive sales tactics. 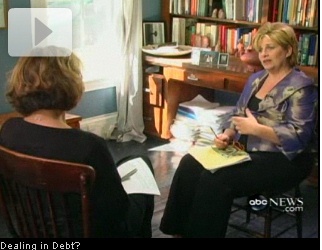 The insiders were featured on CNN’s American Morning, ABC’s Nightline, and over thirty other outlets (see photo). Taking lead responsibility for the AFR website (http://ourfinancialsecurity.org), social networks, and mailing list. 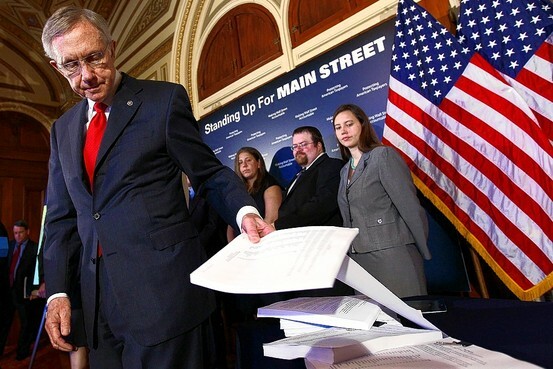 Leading a petition drive among AFR coalition members, resulting in the delivery of over 125,000 signatures to Senate Leader Harry Reid (see photo from the Wall Street Journal). Helping organize the Massachusetts branch of AFR which discussed consumer protection and Wall Street reform with Senator Scott Brown. Senator Brown ultimately voted for the reforms, providing a crucial sixtieth vote in the Senate. Hopefully we’ll repeal the disastrous, ‘let the good times roll’, policies of Reagan.